My nephew was married on Saturday down in Vancouver, Washington. 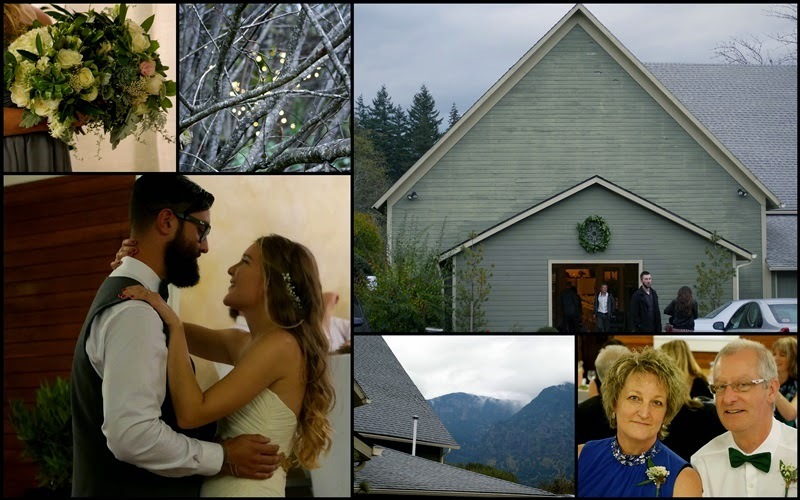 The venue was Cape Horn Estate on the Columbia River Gorge, overlooking the river and surrounded by mountains and autumn-colored trees. It was a lovely affair, simple and elegant. Lots of greenery and white flowers that complemented the country feel of the building. The photos include one of the couple's first dance, and of the groom's parents, my brother and sister-in-law. My brother's hair has lightened considerably, but it was once as dark as his son's. White, green and gold. 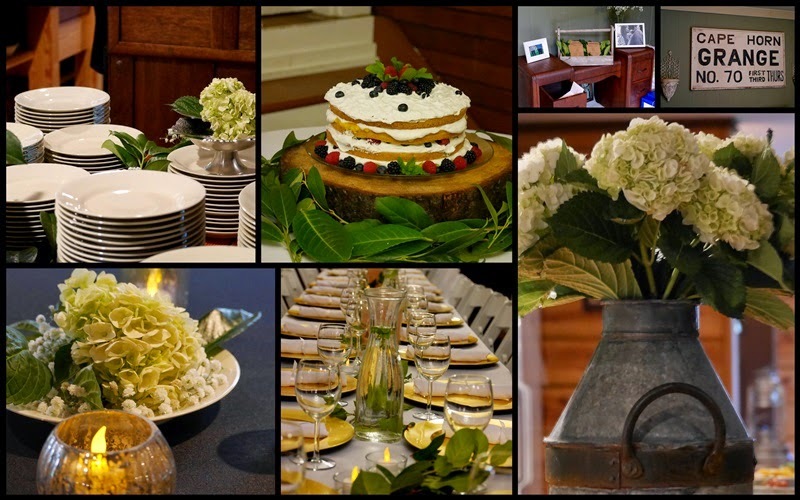 A ceremony filled with personal touches. A delicious meal. Conversations with family whom I see all too seldom. Warmth inside that belied the steady drizzle outside. And now I'm home again, curled up by the fire with a cup of tea, reliving the moments. Joining with Mosaic Monday, hosted by Judith. A simple but beautiful wedding by the looks of it and I always enjoy catching up with seldom seen family at these affairs too. Very lovely wedding. Glad it was close enough for you to enjoy! Just beautiful! Family wedding are such a delight to be part of! Wishing them love to last a lifetime. Congratulations to the happy couple! Wishing them a lifetime of love and happiness. Enjoy your tea! What a wonderful elegant wedding, so lovely to have such happy family days - Congratulations to all! The Gorge is only a half hour away from us, what a beautiful location for a wedding. Congratulations to the lovely couple! I love the elegant simplicity of this wedding. Nice to see your brother/sil. Thanks for sharing such a special day. Lovely shots from your nephews wedding. I like the first dance photo.. The estate sounds lovely overlooking the Columbia River.. Thanks for sharing, have a happy week! Beautiful, elegant mosaics! Thank you for sharing a very special day with us. Have a lovely week! What a lovely couple. As well as that table and cake! :) Yum ! IT looks like the weather outside did not deter a beautiful wedding in the least. Such a beautiful table! We wish the happy couple a life time of joy, love, and happiness. The wedding looks gorgeous. I like the simple beauty. Nice to see family and catch up, isn't it? Love all the green and gold! Lovely, happy wedding. Look at the smiling faces! Lovely mosaics.....and the cake looks amazing! What a beautiful wedding! I enjoyed seeing the photos. We got snow here - about 10 cm. in our area. It looks like early December out there! What a beautiful venue, and gorgeous cake and table! The venue reminds me a bit of where my son and daughter-in-law were married, in a nontraditional setting too (there's was in a barn). Thanks for visiting me and have a delightful week! Lori, everything looked just beautiful! How fun to be able to celebrate with your family. I know your brother and sister in law...what a great photo of them. Thanks for the lovely pic of the newlyweds too. There's nothing like a family wedding is there Lorrie - it's such a happy time! I love catching up with family and listening to the stories. The white hydrangeas in the zinc container are beautiful! Best wishes to the young couple starting their life together. What a special celebration of love...you captured it perfectly. Lets not talk about hair lightening. :) Happy wishes to the new couple. I have never heard of Cape Horn Estate, but it is beautiful. What a special place to celebrate with a wedding. You were close to Portland too. The wedding looks just wonderful. Thanks for sharing. That looks like the kind of wedding that I enjoy. Congratulations to the newlyweds! PS: Blessings and congratulations to your nephew and his bride!